The prime minister has become the latest armchair football fan to air his thoughts about England's midfield combo on BBC Five Live's 606 phone-in. Mr Blair rejected claims that it was time to drop the England captain David Beckham. And he predicted England would perform when they came under pressure, saying they had not really been tested in their first two matches. He also urged England fans to lay off under-fire Owen Hargreaves. Hargreaves, who has been booed, could even learn lessons from Culture Secretary Tessa Jowell, who had bounced back after a barrage of media criticism, he suggested. "I think we've got to give him a chance, to be honest. He hasn't started and played a full game," said Mr Blair. "At this stage the most important thing is that we get behind the team." Tuesday's clash with Sweden would offer a better pointer to the England team's form, said Mr Blair, who admitted to sneaking off business at last week's European summit to watch the football. "What was interesting was that virtually all the leaders - because there wasn't a huge burning issue, actually at the council - were standing around talking about football in the corridors," he said. "So I watched the Trinidad and Tobago game at the same time as I was having meetings." During his 50-minute stint on the football talk show, Mr Blair faced questions on Rooney vs Crouch, Lampard vs Gerrard and whether he felt for Sven-Goran Eriksson as he works with his successor, Steve McClaren. The keen England and Newcastle United fan said he would like to be an attacking midfielder but confessed he was weak on the left wing. He pointed to similarities between managing a football team and being prime minister. Are Beckham and Blair both stars past their best? He called Environment Secretary David Miliband the "Wayne Rooney of the Cabinet". 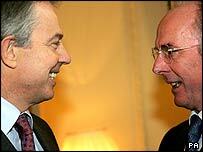 Mr Blair compared his position as prime minister to Sven-Goran Eriksson, who is leaving after the World Cup. "Whether you're Sven or you're me or you're anybody else, in the end you want to be judged on the job you do," he said. "And the only thing he will be focused on is, not frankly, what happens to him after the World Cup but making sure that he wins the World Cup because that is what he's there to do." One caller suggested it was time to drop Beckham and told Mr Blair that "every figurehead has his day". The prime minister, who is stepping down before the next election, confessed: "I'm bit worried by that message. 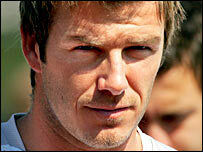 Dropping Beckham was not an option, he argued. "As a crosser of the ball he's better than anyone else in the world probably," Mr Blair added. "I also think he gives the team something as captain. He has the experience because he has played in Europe as well as England. "I think he is a potential match-winner - you saw that in the first match against Paraguay and against Trinidad and Tobago." 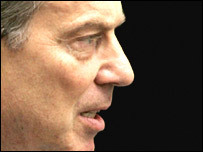 Mr Blair also used the phone-in session to brand footballers' wages as "ridiculous". But he said he could do little about it as capping wages in the UK would simply drive players overseas. And he promised the government was trying to help the hundreds of schoolchildren who were denied a seat at World Cup matches by a tickets scam. "We are looking at that and I think Sports Minister Richard Caborn is trying to sort something out," he said. "I don't know what exactly can be done but obviously for them it's terrible and it's something we need to work on to make sure they can get out there." A Department of Culture, Media and Sport spokeswoman said it would be "very difficult" to find 400 tickets for the children hit by the scam. She said the department was "keen for these kids not to be disappointed twice" so did not want to raise hopes.